Throughout 2018, teacher walkouts and student protests in states across the country highlighted the serious problem of chronic disinvestment in public education. As a result, education became a key issue in many state-level races, and in fact, a number of educators even ran as candidates. While education was not necessarily nationally prioritized at the same level as issues such as health care or the economy, it was an important consideration in many statewide and local races, ranking as the number two issue in campaign ads for governors. In addition to being included in the platforms of candidates for elected office, education was also on the ballot in the form of ballot measures, which asked voters to make a variety of decisions about public education funding and policy—including measures to expand private school voucher programs that hurt public schools. Furthermore, Democrats gained control of the U.S. House, which will have a significant impact on education priorities in Congress—both legislative priorities and oversight of the Trump administration’s education agenda. Now that the November 6 election is over and almost all of the races have been called, it is time to answer a key question: How did education fare in the 2018 midterms? Education-minded candidates in Wisconsin, New Mexico, Kansas, Nevada, Maine, Michigan, and Illinois flipped gubernatorial seats from Republican to Democratic control. In many of these states, investment in education had not yet recovered from the 2008 spending cuts, and some had made more recent cuts to education. Incumbents, as well as candidates from the same party of the outgoing governor, faced scrutiny over their education record, with opponents presenting themselves as alternatives who would increase spending and dedicate resources to students in public schools. In one of the most closely watched races, three-term Wisconsin Superintendent of Public Instruction and Democratic challenger Tony Evers beat incumbent Gov. Scott Walker (R) with a message of increased investment in education. Even prior to his victory, Evers’ entrance into the race forced Walker to defend his education record, and the race became about who would truly be the better pro-education governor. Evers made a convincing case to voters that he would reverse Walker’s cuts to education spending, as well as his attacks on collective bargaining for teachers and other public employees. Additionally, in Kansas and New Mexico, voters elected gubernatorial candidates who were willing to increase current education funding levels that their state supreme courts determined inadequate. In Kansas, former State Sen. Laura Kelly (D)—who bested Kansas Secretary of State Kris Kobach (R)—pledged to invest the recent rollbacks of former Gov. Sam Brownback’s tax cuts to schools and early childhood programs. In New Mexico, winner Michelle Lujan Grisham (D) promised to halt the state’s appeal of the Supreme Court ruling and boost teachers’ starting salaries to $40,000. Even in states in which the incumbent governor won re-election, pressure—from teacher walkouts, for example—pushed candidates to talk about their education plans and make commitments to invest in education. In face of a challenge from university professor and Democratic opponent David Garcia, Gov. Doug Ducey (R-AZ) touted his plan to increase teacher pay. And Gov. Kim Reynolds (R-IA), who ran against former teacher Fred Hubbell (D), highlighted her support for legislation that aims to provide 70 percent of Iowans with some kind of post-secondary education or training by 2025. Compared with issues such as economy or health care, education may not be the same national driver of voters; however, in certain gubernatorial races, the issue helped shape campaign promises and influence outcomes. On November 6, 20 education-related ballot measures were up for a vote in 15 states across the country. * Fifteen of these were funding-based measures that looked to add revenue to public education by introducing new taxes or bonds. The other five ballot measures concerned policy. During the elections, 11 out of the 15 funding-based ballot measures were approved. As a result, for fiscal year (FY) 2019–2020, at least $884 million in state revenue will be added toward public education. This total includes $64 million from Maine, which approved two measures; $500 million from New Jersey; $150 million from New Mexico, which approved three measures; $170 million from Rhode Island, which approved two measures; and a yet-to-be-estimated amount from a measure approved by voters in Montana. Maryland’s approved ballot measure will start adding revenue in FY 2020–2021. Meanwhile, Georgia’s ballot measure designated the ability for school districts to raise funds through a sales tax referendum. Of the ballot measures that voters failed to approve, the one in Colorado was the most significant. The measure, which would have added $1.6 billion to education funding in FY 2019–2020, was rejected by 55 percent of voters. Likewise, funding-based ballot measures were defeated in Missouri, Oklahoma, and Utah. However, the overall success of these funding-based ballot measures—particularly in blue states—demonstrates that there was strong support in this election for increased investments in public education, which bodes well for the future. Even in conservative states, where the “Red for Ed” movement failed to gain significant traction, there were several bright spots. For example, New Mexico approved three separate bond questions dedicated to raising funds for libraries, buses, and schools in general. In one of the most closely watched and hotly debated ballot measures, Arizona voters repealed a bill that would have expanded the state’s private school voucher program, already one of the largest in the country. And this overwhelming, 65 percent rejection of voucher expansion came despite the re-election of Gov. Ducey, who supported the expansion. 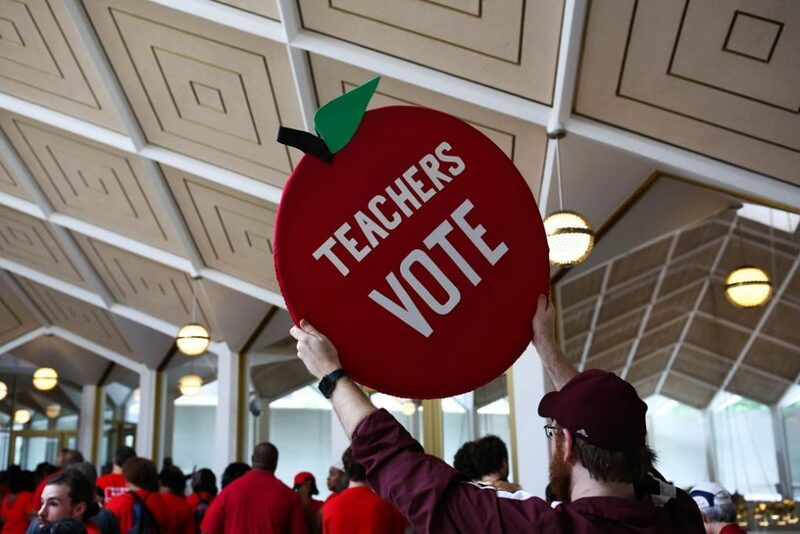 Meanwhile, South Carolinians rejected a constitutional amendment that would have made the state superintendent of education an appointed position rather than elected one. The three remaining education policy ballot measures touched on issues ranging from school board makeup to religion in schools; two measures were approved in Alabama, and one was approved in Florida. At the federal level, Democrats gained seats in the House of Representatives, while Republicans gained seats in the Senate. Split control of the chambers in 2019 means that Sen. Lamar Alexander (R-TN) will likely remain as the chair of the Senate Committee on Health, Education, Labor, and Pensions Committee, while Rep. Bobby Scott (D-VA) will likely become chair of what is now the House Committee on Education and the Workforce. This could provide an opportunity for bipartisan leadership on education legislation, such as reauthorizing the Higher Education Act of 1965. Additionally, Scott will use the Democratic majority in the House to pursue some key priorities. Pre-election analysis of House races often focused on potential oversight of the Trump administration; Rep. Scott has already signaled his intention to scrutinize Secretary of Education Betsy DeVos’ actions on issues ranging from approval of state plans under the Every Student Succeeds Act to enforcement of civil rights protections for transgender students and survivors of campus sexual assault. While the committee has not yet laid out its full plans, there are many other issues it could use its investigative authority to address, such as state-level corruption in for-profit, virtual charter schools and tax credit voucher programs. A new majority in the House of Representatives also presents an opportunity for lawmakers to advance legislation focused on a range of progressive education priorities, from addressing crumbling school infrastructure to increasing teacher pay. While some of these proposals might face an uncertain future in the Senate, incoming lawmakers will want to address the widespread desire across the country to invest in public schools and pay teachers like professionals. In electoral races at the federal and state level, the debate around public education inspired many educators to step up and run as candidates. In fact, the National Education Association (NEA) estimates that nearly 1,800 educators ran for state legislative seats this fall, the vast majority of them as Democrats. Some of these educators saw success in the election. For example, in Oklahoma—following teacher walkouts in April—four public school principals won seats in the Statehouse. And while other Oklahoma educators lost their races, many remain hopeful that, in two years, there will be another opportunity. Other educators won in several high-profile races on Tuesday. For example, Jahana Hayes (D), the 2016 National Teacher of the Year, became the first black woman from Connecticut elected to serve in Congress. And former chemistry teacher Chrissy Houlahan flipped Pennsylvania’s 6th District blue. In addition to state and federal congressional races, there were seven state superintendent of education positions up for election on November 6. Although two of these races were ultimately uncontested, the other four races featured educator candidates who engaged in fierce debates over education reform. Hours after the polls closed, two of these superintendent races were too close to call—and final results were still not in as of this column’s publication. The fact that the superintendent race in Arizona, which pitted speech therapist and bilingual teacher Kathy Hoffman (D) against former U.S. Rep. Frank Riggs (R), was so competitive in a very red state may be a testament to Hoffman’s support for the “Red for Ed” movement. Meanwhile, in California, Democrats Marshall Tuck and Tony Thurmond are still awaiting the outcome of their contest, following the most expensive superintendent race in history. $50 million was spent on the campaigns, underscoring the importance of education to voters. In the 2018 elections, education was a key issue in gubernatorial races. In states where education is underfunded, candidates such as Evers, Kelly, and Grisham built winning campaigns by presenting a stronger pro-education platform than their respective opponents. Even in races where pro-education candidates fell short of defeating incumbents or the prevailing political party, attention to education forced all candidates to compete on the issue. Additionally, 11 out of 15 funding-based ballot measures—designed to bring much-needed additional revenue to schools—were approved by voters in states such as New Mexico, Maine, and Georgia. Moreover, voters in Arizona rejected an expansion of the state’s voucher program, which would have harmed public education; and they forced a race for superintendent—one that involved two candidates with opposing views on vouchers—to a statistical dead heat. Finally, educators ran for state legislative and federal congressional seats in historic numbers. Several saw victories, even in states where the political odds were stacked against them. And while there were many instances where the “Red for Ed” movement failed to shake entrenched political loyalties, the reality is that change requires having conversations more than once. If pro-education candidates keep running at this rate, the issue will remain one that voters demand candidates to take a stand on. Support for education, and more specifically, candidates’ approaches to addressing issues of education funding and policy, may continue to break along political fault lines. However, in 2018, the issue of education was salient to voters. In future elections, it is important for pro-education candidates to build on the lessons and energy of the most recent election cycle. Jessica Yin is the special assistant for K-12 Education at the Center for American Progress. Scott Sargrad is the managing director of K-12 Education Policy at the Center. *Authors’ note: This list of 20 ballot measures was compiled using information from the National Conference of State Legislatures (NCSL), whose database produces 21 results when users search for 2018 general election ballot measures under the topics “Education: Higher Ed” and “Education: PreK-12.” The only measure not reflected in the authors’ list is the Massachusetts veto referendum on gender anti-discrimination legislation, which centers around a bill that does not include schools in its purview and therefore is not an education-related measure.